Also know as the ‘Fragrant Alcantarea’ this is a bromeliad that likes a sunny position. The botanical name is Alcantarea odorata (syn. Vriesea odorata) and it does indeed have fragrant flowers. Large arching foliage, make this one of the best Alcantarea species for landscaping in warmer climates. 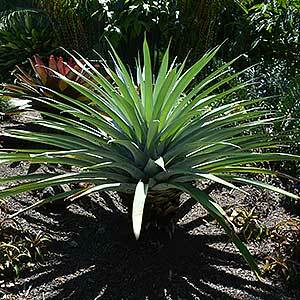 It is long lived, well suited to growing in containers and is low care. The fragrance comes from the flowers, however they do only appear on mature plants. The flowers are attractive, yellow on red stems. Really the blue green foliage is the attraction, and because it is pale in colour it looks good in part shade as well. The foliage is the main attraction so use Alcantarea odorata in a position where it can be shown off. Planted as a single specimen in a container it looks spectacular. In the garden, give it a little room to spread and grow into its natural attractive symmetrical shape. Best grown in full sun to part shade. This is a low care plant needing only to have the old foliage pruned away as it browns off. Having a ‘tank’ in the centre, keep this filled with water, flushing it out on occasions for appearance. Any well drained soil will do, not soggy wet soils. You will not really need to fertilise the plant at all, simply mulch around it lightly once a year.